Hey everyone!! Its been a while but I have some fun to share today. On February 19th I ran my first race of the season and it was SO much fun. Our local Fleet Feet store teamed up with some other local businesses and put on a great race in Harrisburg, PA. What made it so great? There are really a few reasons. First- I made designed my own shirt and got to rock my awesome Crazy Compression socks. 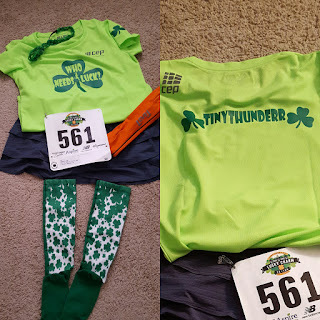 I was super excited to wear both and run a holiday themed race, which was a first for me. I also sported the Athleta Stripe Swagger Skort - which I had never worn before and thank goodness it was comfortable as crazy!! Second- All my friends were there!!! This wasn't even ALL of us since some missed the photo opp. The third reason this was a great race?! I did a pretty darn awesome job running it. Although I wish I hadn't started out quite as quickly and saved a kick for the end, I am really happy with how this race went. I started out in the 8:30 m/m range and this felt great! By about mile 4, not so much. BUT- I did finish feeling pretty well and at 53:50 chip time and number 99 out of 290 people. Averaging an 8:40 pace is something I only could have dreamed of at this time last year. This picture was right before the finish.. I was pretty wiped out! Did you do a St. Patty's themed race? What else are you training for this spring?